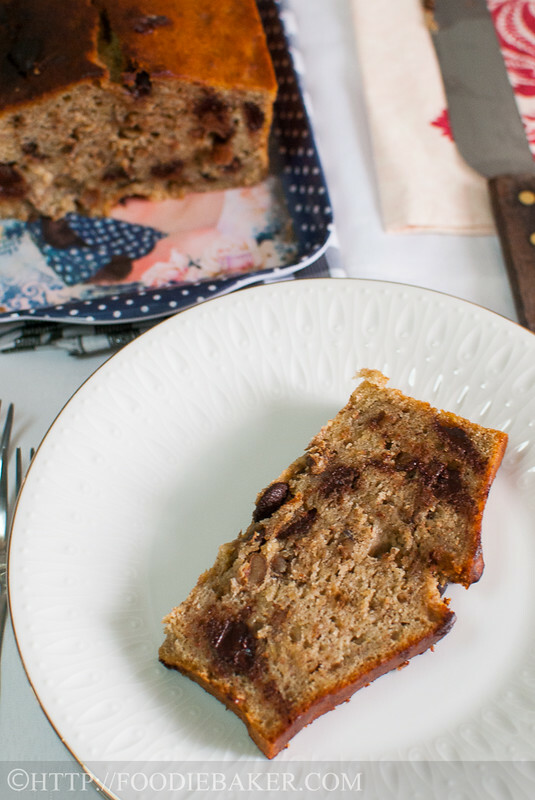 This is a simple, classic, no-nonsense, moist and delicious loaf (I simply refuse to classify it as a bread or cake, so I’m just going to stick with loaf), made with brown sugar, plenty of bananas, chocolate chips and a hint of cinnamon. I actually scaled down the recipe to 2/3 so that I can bake it in my 8×4-inch loaf. After scaling down the recipe, I should need only 1 cup of mashed bananas, but it seemed to have slipped my mind and I kept thinking I need 1 1/2 cups instead, so I kept peeling, mashing and measuring when I abruptly stopped myself and realized I had already mashed 1 1/3 cups. What am I going to do with the additional 1/3 cup of mashed bananas? I am certainly not going to spoon it into my mouth – mashed bananas just looked… You know what I mean? Not wanting to waste any bit of the bananas, I decided to just add all of it into the batter – and it resulted in a really intense banana-y and moist loaf. Not sure how it will fare if I have used lesser, but I’m glad the loaf turned out fine delicious in the end! Have you ever measured a key ingredient wrongly in a recipe? When did you realized, and what did you do? Most importantly, how did your dessert/dish turned out? Would love to read all of your “kitchen disasters”! On a side note, my apologies for not being able to reply all of your lovely comments. I’ve been swamped with work lately, sounds like a really lame excuse but unfortunately it’s true (sigh… life of an auditor…) Please forgive me! My priority now is to keep this blog updated as much as I can, hence I’m seriously lagging behind in replying the comments… thank you so much for your understanding! Let’s move on to something more happy: step-by-step photos for this recipe! 3) Cream butter and brown sugar together until light and fluffy. 4) Add in the mashed bananas and beat it in. 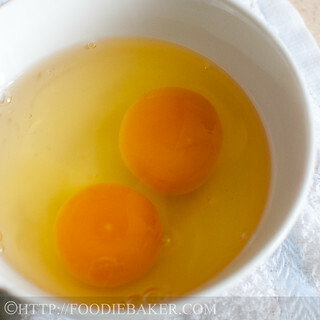 5) Crack 2 eggs in a small bowl. 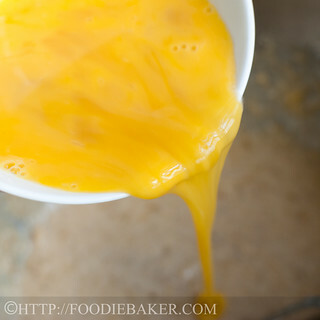 6) Beat the eggs lightly, add into the batter, and beat it in. 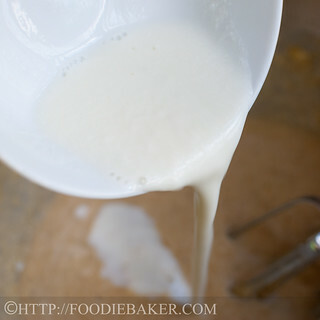 7) Add in some buttermilk and beat until just combined. 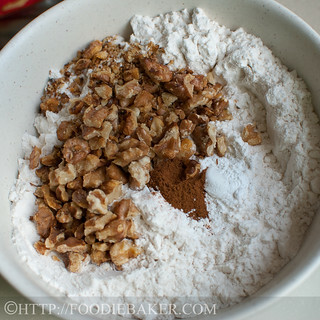 8) Mix flour, baking powder, baking soda, cinnamon, salt and chopped, toasted walnuts together. 9) Add in the flour mixture and stir to combine. 10) On a last minute whim, add in some dark chocolate chips. 11) Transfer the batter into a loaf tin. 12) Bake until done! 1) Bake Along hosted by these wonderful and sweet ladies: Joyce from Kitchen Flavours, Lenafrom Frozen Wings and Zoe from Bake for Happy Kids. Click on the little froggie below to see how other foodies’ bakes turned out! 2) Recipe Box hosted by the amazing Chaya from Bizzy Bakes! Preheat the oven to 175 degrees Celsius. Butter a 8x4-inch loaf pan and line the bottom with parchment paper. Set aside. 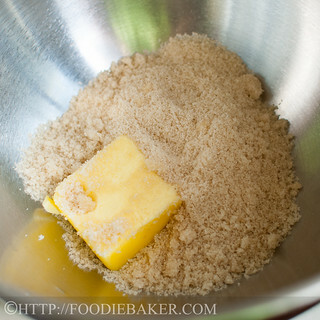 Place the butter and sugar in a large mixing bowl. 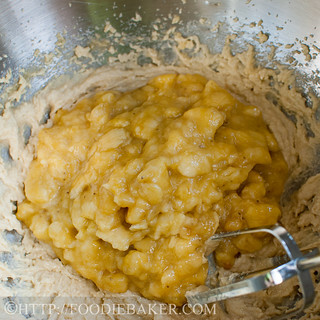 Beat, using an electric mixer, on medium-high speed for 5 minutes until the mixture is pale, light and fluffy. Add in the mashed bananas and beat on medium speed for another 1 minute. Add in the beaten eggs and beat on medium speed for another 1 minute. Add in the buttermilk and beat on low speed until just combined. Combine the flour, baking soda, baking powder, cinnamon, salt, walnuts and chocolate chips in a small bowl and stir to mix them together. 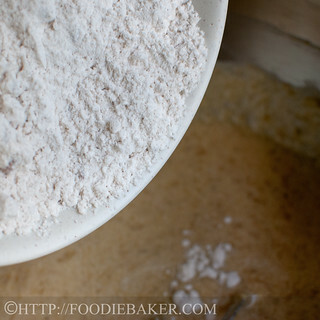 Add the flour mixture into the batter and stir with a large wooden spoon until just combined (until no flecks of flour is visible). 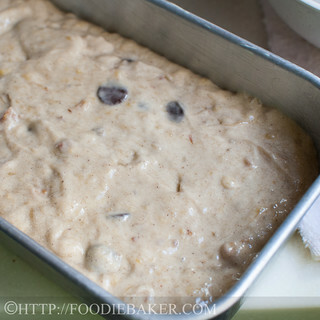 Transfer the batter into the prepared loaf tin and spread it evenly with a spatula or the back of a spoon. Tap the loaf twice on the table counter to get rid of excess air bubbles and bake for 45 to 55 minutes until a skewer inserted into the center of the loaf comes out clean. (Check the loaf after 30 minutes, if the top is getting overly browned, tent it with a piece of aluminium foil.) Let the loaf cool completely on a wire rack. Turn the loaf out onto a serving plate. Slice and serve! Ingredients: All ingredients should be at room temperature. 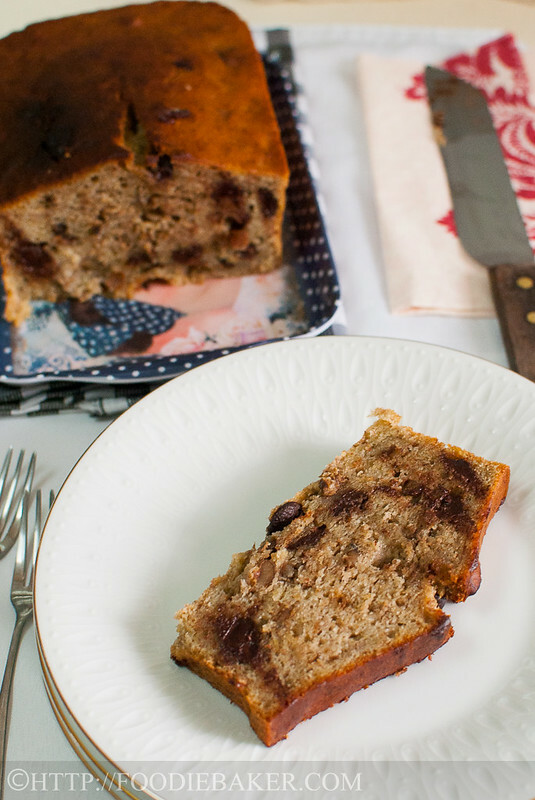 Use very ripe bananas: They are softer and sweeter. 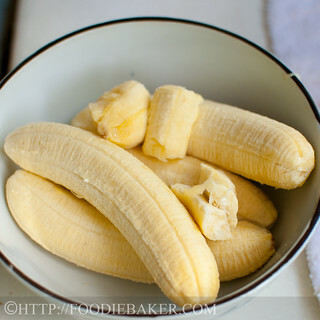 If you have very ripe bananas but have no time to bake them, peel the bananas. Wrap the bananas individually with plastic wrap and stick them into the freezer until needed. Substituting buttermilk: Measure 1 teaspoon of vinegar / lemon into the measuring cup. Top up with enough fresh milk to get 1/3 cup of liquid. Stir gently to mix the acid and milk together. Let stand at room temperature for 5 minutes before using (stir the mixture before using). Cinnamon: If you’re not a fan of cinnamon, simply omit it or substitute with 1 teaspoon of vanilla extract. 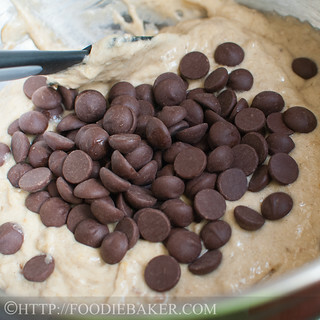 Chocolate chips: Purely optional – you can use milk, semisweet or dark chocolate chips. Love the raisin in there too. Great little bead. Extra banana sounds good to me and probably made it extra moist. Hi Jasline. Banana bread looks great. I love the idea of adding chocolate. Jasline, nice to visit your blog again. I’m lack of mojo to blog and bake. Busy with my work lately. 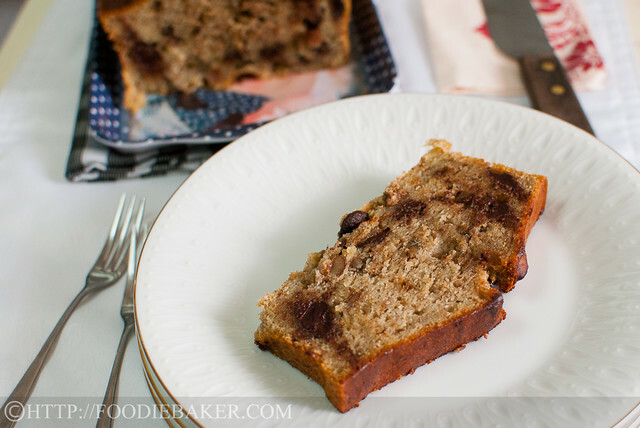 Your banana nut bread looks yummy with raisins… Perfect for breakfast and during tea time. This would be perfect for afternoon tea! Yum, this is such a classic recipe, I love it! Bananas and chocolate are a winning combo. I love the step by step photos, they’re gorgeous! Just like this loaf. hi jasline, i actually put less than the bananas required because that was all i had, nevertheless the taste was delicious. I remember there was a time i read the amt of butter in the cake, much more than i should be and my cake was floating in oil during the baking process 🙁 Thanks so much for baking along despite your busy schedule, always glad to see you around! 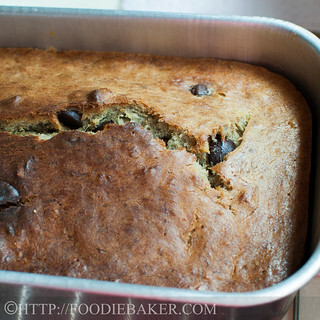 I think more bananas made it all moist… looks great! I enjoy everything about banana bread, from the moment I get that first whiff of it baking into the oven to that first piece, still warm with a bit of butter melting on top. What a treat! Yours, with its chocolate chips, sounds perfect! Mine is also baked with 2/3 of the recipe and think that mine is very intense with bananas too. I reckon that the extra 1/3 cup of banana wouldn’t has made a lot of difference for yours. Have to try this as it’s exactly the type of loaf I like. 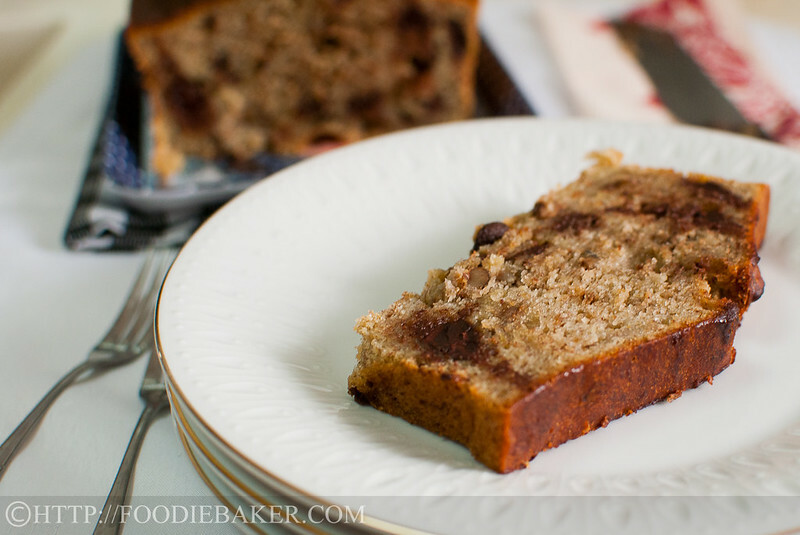 You banana nut loaf is nicely baked. Looks moist. I always like to see your step by step pictures. Most of the time I would add in slightly more bananas than the recipe calls for, and it always turn out fine. But for this bake, I’m a good girl, I used the exact amount! Haha! I’m glad yours turned out great! Bread or cake? Yeah, I think a loaf is the best description!